I think I need to know more about his death,too. It is really strange. It has been a while since noone mention his name on news, and then BAM he is now dead. Is there any link to website or video that will help in answering this question? I think there needs to be more transparency in this issue. How can we be so sure that it is him when his body is already completely disposed in the sea. Surely, he is dead it doesnt really matter where his body is kept. Why have to be in the sea straight away. This is just my opinion. Please enlighten me. Lol @ Obama did nothing. He stated in his campaign that finding Bin Laden dead or Alive was something his administration would do. There were numerous of meetings held since August particularly several taking place in February. To say he did nothing is clearly just being bitter and negative. I though it was them who gave Obama's localization to the Americans? No it was a Guantanamo detainee who gave them the name of his chief courier, who they then tracked, and found his residence which was far too large to be his own, and then worked out Osama lived there. The residence is huge, people would be coming and going, and there are various reports of the local police assisting him. The pakistani government knew about his possible location on some level, the fact the US didn't inform anyone, not even the government of the country they were operating in, tells you they don't trust anyone, least of all the pakistani government. I have lots of Muslim friends who knew nothing about this ritual and always bury their dead in some white sheets. They are Pakistani Muslims. I think shooting him dead will anger his followers tbh. There is something not right about the American claims; if Bin Laden had been killed there would be video footage of his entire body rather than one leaked photograph (if there is footage, I'm surprised it hasn't been released). they took his DNA and they have DNA of family records to cross reference it. Just gotta wait for the results..
02 May 1998: The Battle of Hogwarts. Voldemort confirmed dead. 02 May 2011: War on Terror. Osama bin Laden confirmed dead. Coincidence I think not. Well done Harry. It is Islamic tradition to bury the body within 24 hours. The Americans asked the Saudis to take the body but they refused. I imagine they buried him at see to prevent his grave from becoming a shrine. Undoubtedly counterfeits that they are in the process of creating and releasing. If I take a picture of something, it takes me 30 seconds to upload it on the net to show everyone. If the US officials encounter the world's most wanted terrorist, it takes them 2-3 days to 'release' pictures of it. Something fishy. 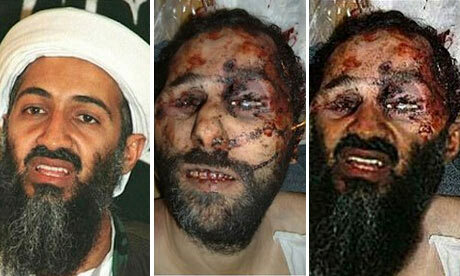 02 May 2011: Osama bin Laden confirmed dead. how about another bank holiday? The real truth? Is there a false truth? It's a custom/tradition I've heard about before. They buried him at sea so that his body couldn't be found and turned into some sort of martyrdom shrine. Yes, killing him was always going to anger his followers but they're trying to lessen the inevitable repercussions I expect. If they didn't care about the consequences then they might as well have put his head on a spike outside the tower of london or something like that. But doing something like that would clearly be unacceptable as it's extremely disrespectful. Exactly, the credibility of the source. Every single major worldwide news organisation is reporting this as fact, yet some students with tin foil hats on an irrelevant forum say the contrary. "It is now being widely reported that Osama Bin Laden's body has already been disposed of at sea"
Why have they disposed of his body so quickly? Isn't his body the only evidence that it is actually him they killed? "A US official quoted by Associated Press news agency said Bin Laden's body had been buried at sea, although this has not been confirmed." It's odd that he was buried at sea. What about all the Taliban soldiers who are killed - I doubt they are buried in 24 hours? I dunno. Given time, photos will be released and his dead body will be confirmed.